Falmouth Cruise Port is one of the best in the Caribbean. 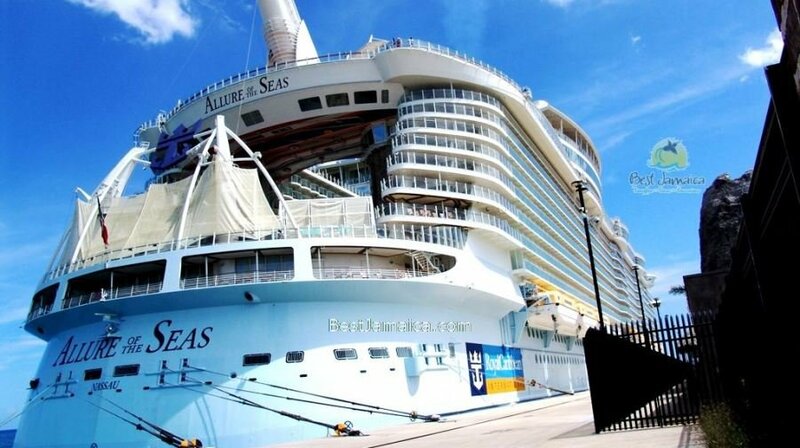 This well laid out port is the Jamaican home for Royal Caribbean cruises which calls port approximately 5 times weekly. The port of Falmouth is probably the best placed port in Jamaica as it is close to everything. Montego Bay, the tourism Capital of Jamaica is a mere 30 minutes’ drive to its west and the ever popular Ocho Rios is an hour east of the charming port of Falmouth. Best Jamaica, the most guest centric tour company on the island offers top quality private transportation from the Falmouth cruise port to your favorite local attractions. Blue Hole Secret Falls is the best waterfalls in Jamaica hands down. If you will be arriving in Falmouth on a cruise and would like to indulge in a natural adventure, then the Blue Hole should be an easy pick. This is a complete waterfall where one gets to jump, rope swing, dive, swim, a little cave exploration or just simple taking a plunge. Best Jamaica offers great rates for any size group or even if only one person is interested. A Horseback Ride & Swim adventure is possibly the dream of many. There is no better place to do it than in the warm waters of the Caribbean. 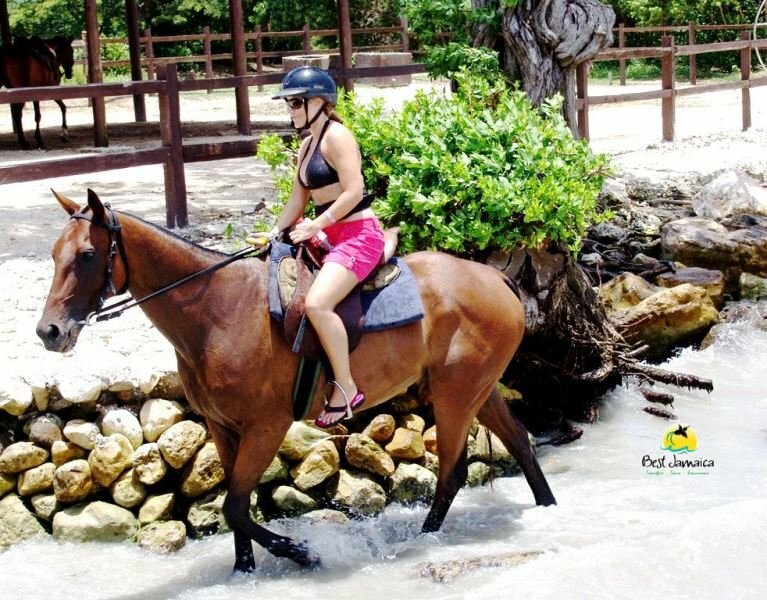 Best Jamaica, the number one tour company in Jamaica offers top quality horseback ride excursions from the Falmouth Cruise Port. Being approximately a 4-hour excursion, we would suggest combining this excursion with another. Best Jamaica is totally available to treat you to a great time and help you to create lasting memories of Jamaica that will be the envy of your friends and family. Dunn’s River Falls need no introduction. It is Jamaica’s premier tourist attractions which attracts hundreds of visitors daily. Best Jamaica, the most guest centered Tour Company on the island offers top quality private tour from the Falmouth Cruise Port to the Dunn’s River Falls like no one else can. No group is too large nor small for us. If you are even a mild fan of Bob Marley and haven’t seen him live in concert, this is probable the closest you will ever get to him. Bob Marley, the undisputed Reggae Legend was born in a small community called Nine Mile on a hillside which is incidentally his final resting place. They have opened up the house in which he was born as well as the house he lived in with his from 6 months old until he moved to Kingston as a small boy. 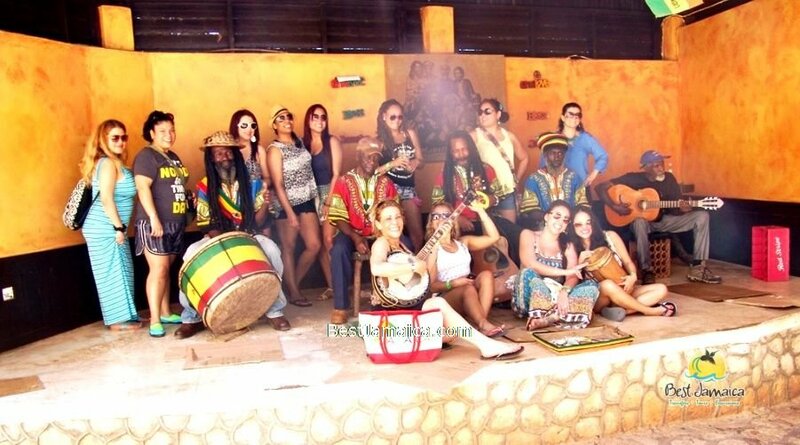 The tour is a great experience for visitors to Jamaica. Montego Bay is the tourism capital of Jamaica, which dubbed the complete resort by the Jamaica tourist board. It is the epicenter and makes a great highlight tour. The landscape of the city of Montego Bay is a stunning beauty; and to see the levels of her development is astounding. Horse Back Ride and Swim/Blue Hole Secret Falls. For the adventurous this is the perfect combination. 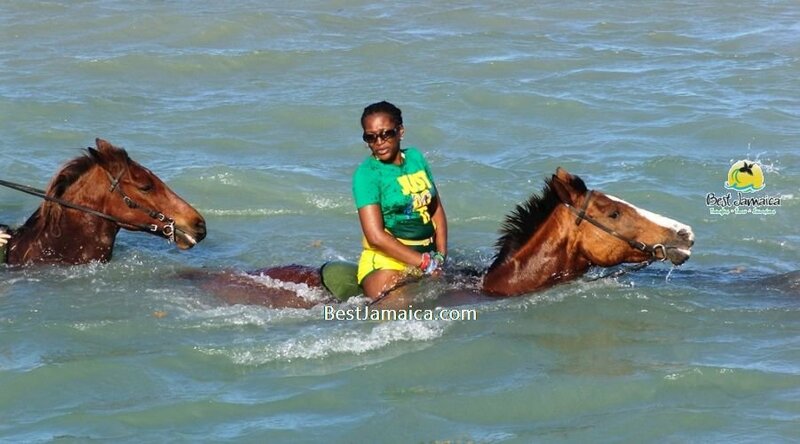 It is the dream of many to take a horse for a swim and there is nowhere better to that than in the warm Caribbean Sea. It is a once in a lifetime opportunity which should be explored. The Blue Hole Secret Falls is another great adventure. At this water fall one gets to rope swing, jump, dive, swim and even a little cave exploration. A match made in heaven is how many visitors describe this combination. The Blue Hole Secret Falls is a natural phenomenon that have many people stunned and amazed. It is blue, deep in most parts, magnificent, beautiful and totally enjoyable. 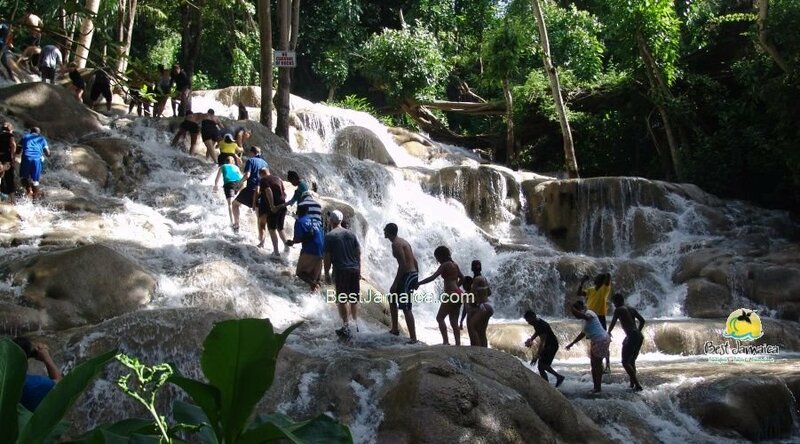 It is the best water falls in Jamaica and so we recommend combining it with river tubing in Ocho Rios as well. Both excursions are done on the same river but in separate location. 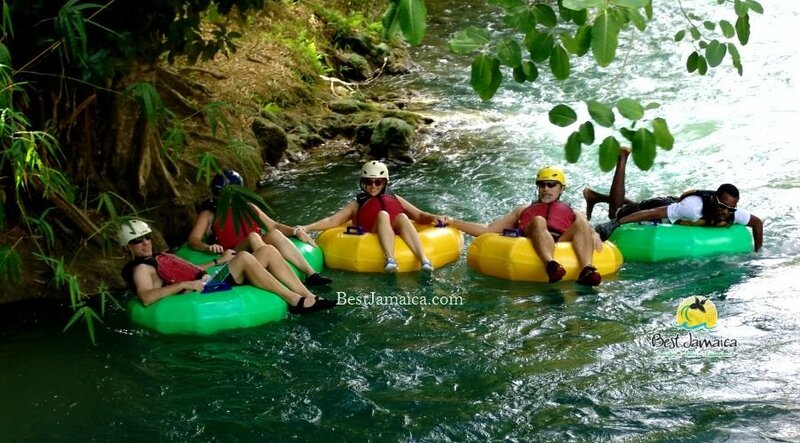 As for river tubing, the river is swift enough for a little adrenalin but safe enough for kids. Here we go again. This is two of the best excursions available and to combine them is just double the fun. Our aim at Best Jamaica is to satisfy and fulfil the unique travel, fun and adventure needs and desires of all our guests. For this reason we are offering this combination because of its popularity and thrill level. The Hampden Rum Factory has been producing rum since the early beginning of rum making on the island in fact since 1753. It is about 45 minutes’ drive from the Falmouth Cruise Port which makes it very accessible. If you have even the mildest interest in rum, this tour is still for you. It is a great way to look back into the islands history and enjoy a drink or two of some of the best quality rum on the market.